On 12 October 1492 Columbus discovered the New World. In the following decade a number of Spanish colonies were founded in the West Indies, many of the settlers being ex-soldiers. They were a hardy, adventurous and unruly crew, no longer able to find suitable employment in Europe. They carved a foothold for Spain in the Indies, but quickly became restless in the role of settler. Anxious to avoid the dull work of the administrators and planters, these men began to seek new territories to exploit, once again turning their faces towards the unknown. 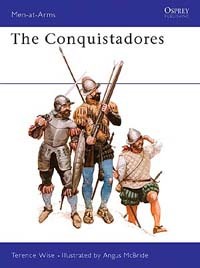 This title documents both the Conquistadores themselves, and their formidable enemies in the New World - the Aztecs, Incas and Maya.